After months of teasing us with that step on a mythical hoverboard, Lexus has finally unveiled the impossible; A fully working hoverboard! I can’t believe what my eyes are seeing. I had doubts about the new technology like many of you who showed similar sentiments on our Facebook post. But, Lexus has been true to its word, and it has finally revealed its Slide board in a comprehensive video showing skaters having the time of their lives. Take a look at it now and feast your eyes! The project was undertaken by the Tokyo branch of Lexus and boy they have delivered. According to its website, the hovering beauty uses the right combination of superconductors, liquid Nitrogen and levitation magnets to achieve the impossible. It is made from an insulated core of superconductors that need to be maintained at low temperatures of -197-degree centigrades. To cool it at such low temperatures the core has sizeable amounts of liquid Nitrogen to provide the cooling it needs. The board is then placed on a track containing permanent magnets. When the superconductors are cooled, they hover around a significant height and can be boarded by a person. The height cannot be increased or decreased at the moment as fictional hoverboards can do, but it is a start of much greater things. It took some time for the team to perfect the Maglev technology to be used on this board. The right amount of thrust provided by the magnets and other components had to be designed accordingly. A new track had to be built, and testing on it took many sleepless nights from the team. 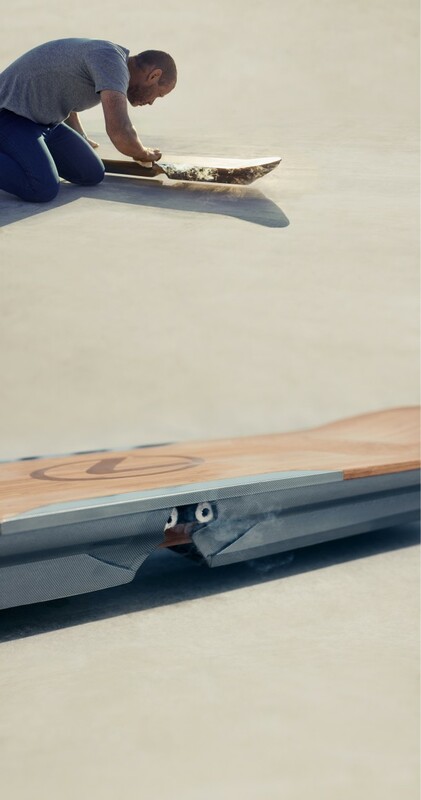 Hats off the great engineers at Lexus, who realized this dream of hoverboarding. I just have one question now. When is it going to be available in amusement parks? !